This week is Farm Week! 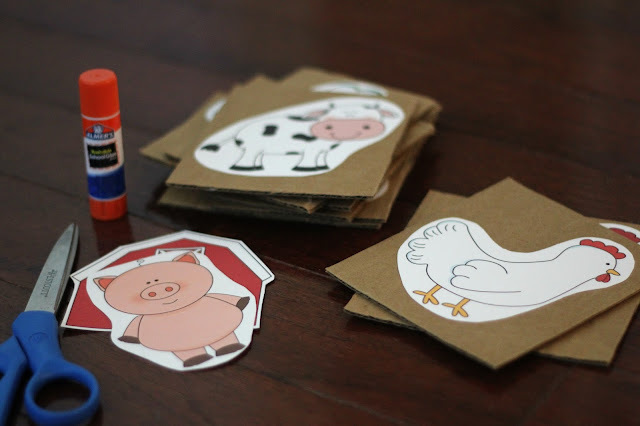 We've shared a few farm animal crafts and activities over the past few years and I am excited to dive in a bit deeper and share some awesome farm themed children's books as well this week! For our Weekly Virtual Book Club for Kids we are featuring The Little Blue Truck by Alice Schertle this week! 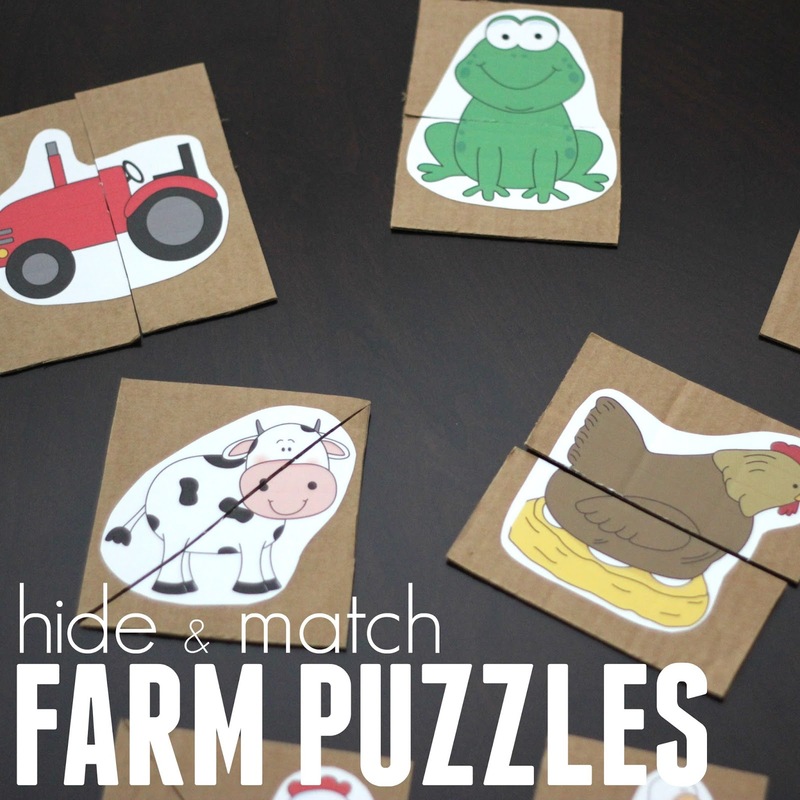 To kick off the week we decided to play around with some farm animal pictures and put together a farm animal puzzle game. This activity introduces a few of the basic animals you might have on a farm and teaches their names. This is an easy game to pull together. You only need a few materials. I prepped the game ahead of time. 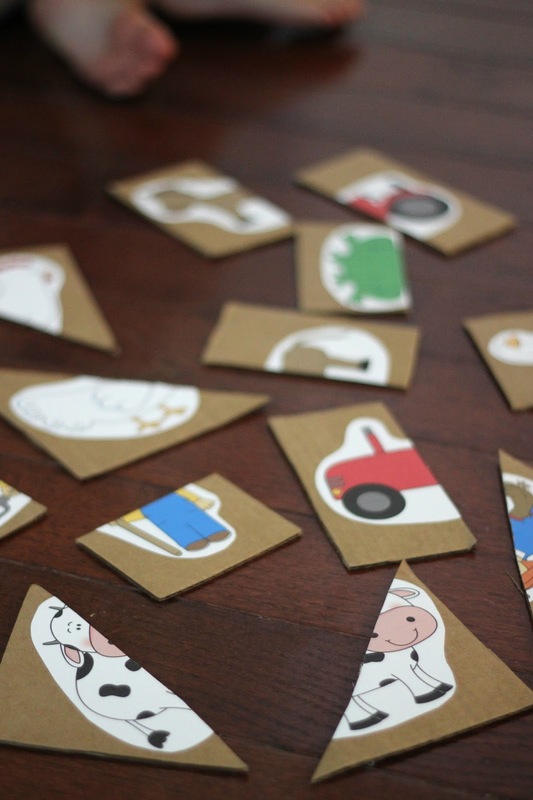 To make the farm animal puzzle game you start by printing out the farm animal images and then cutting them out. I cut around the images but didn't do a really tight cut because I am all about keeping things easy and simple! Visible white borders are fine! 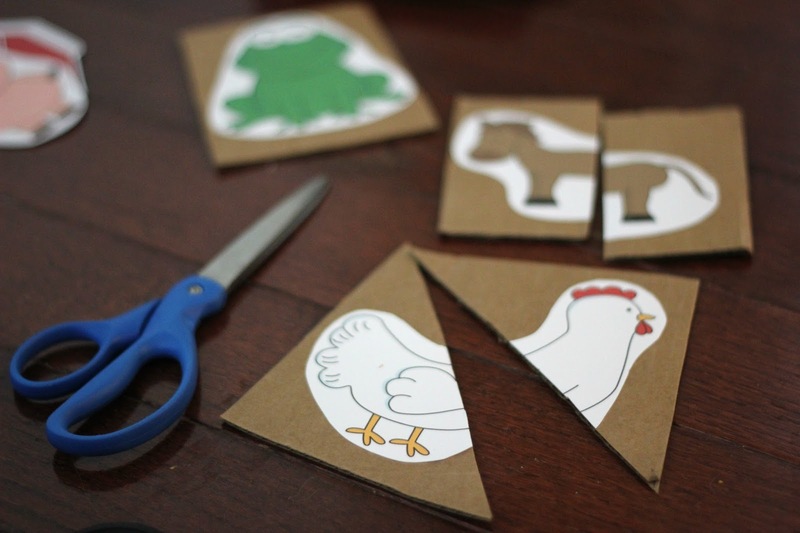 Once the animals (and objects- like the barn) are cut out, glue each picture onto a square piece of cardboard. The piece of cardboard doesn't have to be perfectly cut. 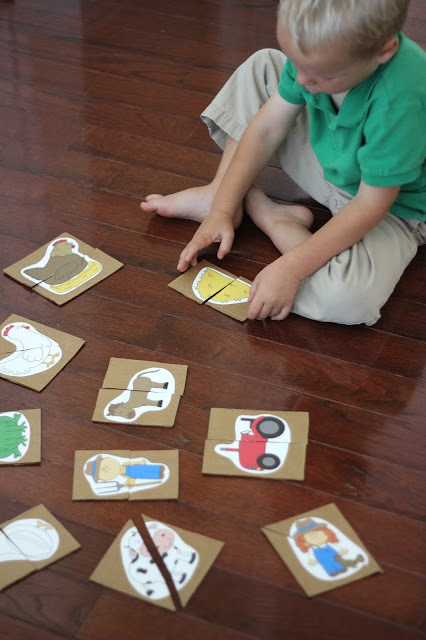 Once the glue is dry, cut the cardboard and image into two pieces to make simple cardboard puzzles. You can cut diagonally, horizontally, vertically, or skiwampus! Whatever you want to do works! 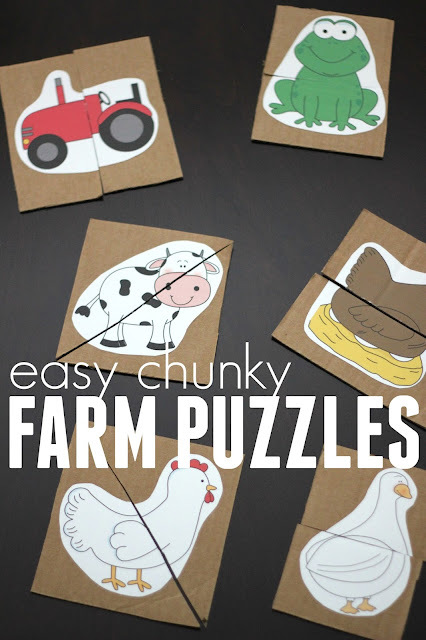 The goal is just to create simple farm animal puzzles. The cardboard base makes them easier to manipulate for little hands. For older kids you could cut the pictures/cardboard into 3-4 pieces. Once the pictures are cut up, you are ready to play! Start by hiding the puzzle pieces around one room in your house (or outside). Make sure you don't make them too hard to start. For toddlers and preschoolers I like to keep things only partially hidden so that the kids don't get bored too quickly and give up! Encourage your kids to look for the puzzle pieces and then match the pieces together to complete the simple puzzles. While you are playing, talk about the animals and farm objects that are in the pictures. Talk about the animals in the farm themed books you've read too! Discuss whether each animal was in The Little Blue Truck, or not. This activity is a simple way to work on visual discrimination and matching while also getting little bodies moving! All of these posts will go live on October 10, 2016. Do you have any other favorite farm themed activities, books, or crafts that you can share? What a smart idea! I love extending books into play. Love inexpensive diy games that you dont need lots of resources to make! Putting them on cardboard is brilliant! I bet little hands love that texture! I love these easy puzzles for young kids! I love that you added a hide and seek and movement element to the puzzles. This is such a fun idea and totally ready for on the go fun too. 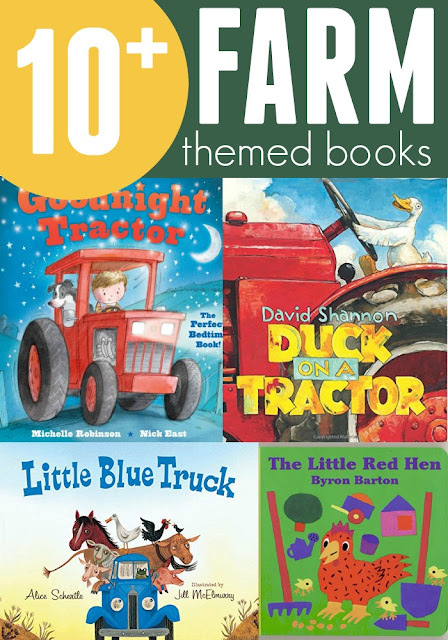 Loving this week's farm week theme and all of the activities that everyone is sharing for the book Little Blue Truck. Can't wait to see what all of our families and classrooms share in the Weekly VBC Facebook Group. Loving organizing VBCforKids with your Kristina!